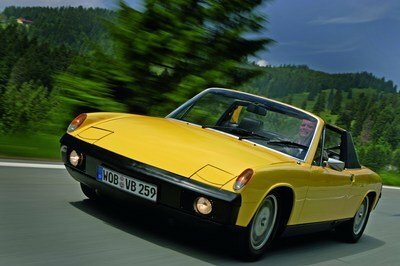 German tuner B&B Automobiltechnik has shown the ability to build tuning programs for a number of auto brands. Whether it’s a hot hatch like the Volkswagen Polo R or a sports car like the Audi R8, B&B has a kit for every occasion. This time around, the tuner set its sights on the BMW M4 and predictably, the kit is as impressive as anything the company has built in recent memory. The central focus of this program is the comprehensive engine upgrade that’s made up of three separate stages. I’ve seen this kind of tuning strategy from B&B before and never have I seen the tuner come up with something mediocre. 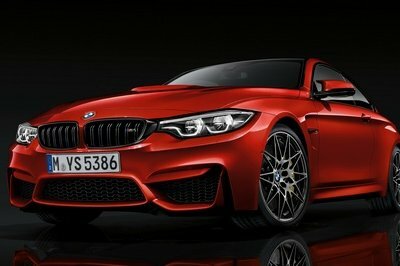 So it comes as little surprise that the program for the M4 comes with a lot of aftermarket modifications on the car’s 3.0-liter twin-turbo inline-six engine. The good thing about this program is that customers can choose what kind of power upgrade they’d like. The Stage 1 kit offers enough extra power to make a difference on the M4’s performance. The Stage 2 kit adds on that with more power, and, well, the Stage 3 kit does the same, helping the M4 reach a level of performance normally reserved for some of the finest exotics in the land. B&B’s new M4 tuning kit is as comprehensive as they come, offering enough choices for customers who may want their M4s to be tuned to a certain level. On that end, the German tuner has once again come up with aces. 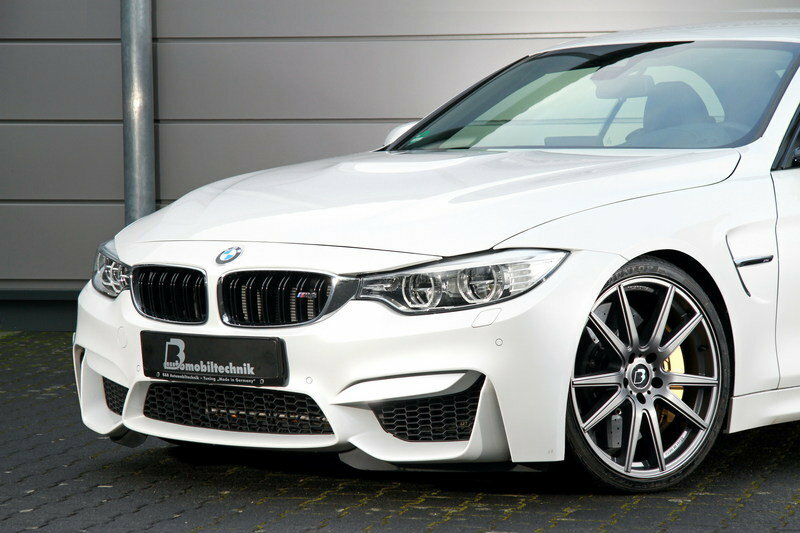 Continue reading to learn more about the BMW M4 By B&B Automobiltechnik. Exterior modifications are limited to a new set of wheels that B&B is offering as an alternative to the 19-inch BMW M-wheels. 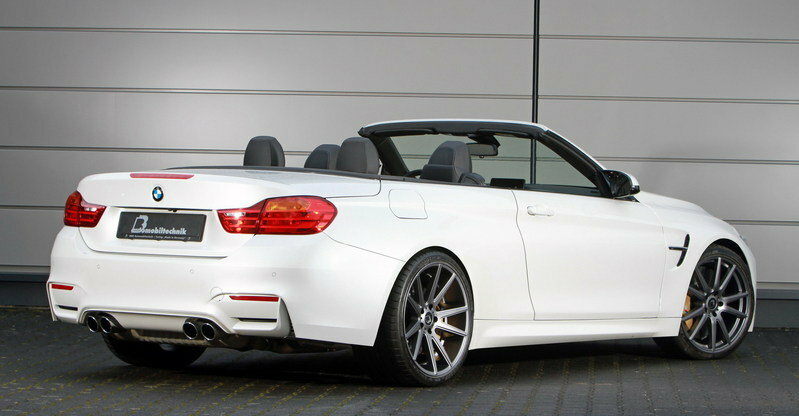 Should a customer wish to change the wheels on his M4, B&B has 20-inch alloy wheels shod in 255/30R20 and 305/25R20 tires. 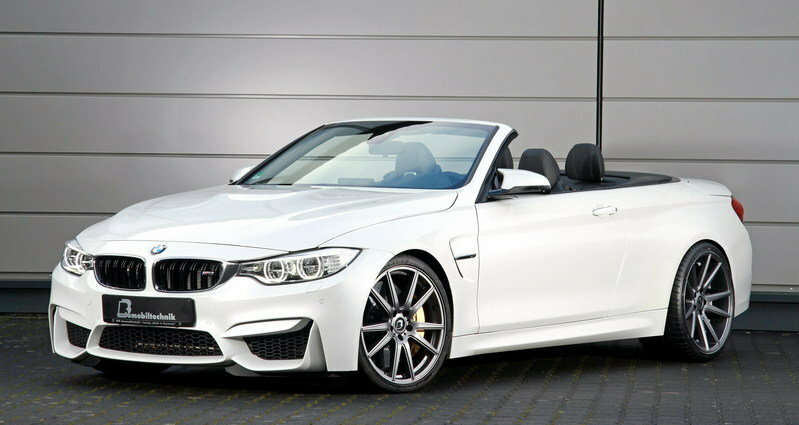 Other than this offering, the exterior of the M4 remains in standard configuration. The interior also remains unchanged, although it can be said that the M4 already has a well-dressed cabin so there’s really no need to have any modifications done on it. 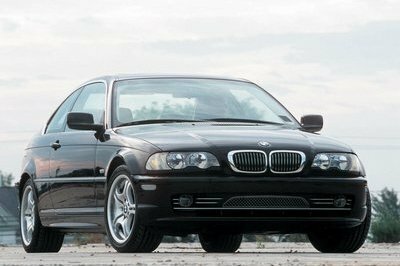 So, instead of spending time working on something that already looks spiffy, B&B opted to concentrate all of its time and resources in the M4’s high-strung 3.0-liter inline-six engine. Before diving into that extensive upgrade on the engine, it’s important to know that B&B’s engine program is as comprehensive as it is impressive. A lot of work was put into the BMW M4’s inline-six engine, as B&B created three separate tuning stages with varying levels of power increase. All three stages come with modifications to the turbochargers to go with a higher-flow intake tract, larger exhaust downpipes, more efficient charge air cooler, and an ECU remap with revised fuel, spark and boost parameters. All these upgrades are done in different degrees to account for the different amounts of horsepower depending on the tuning stage. 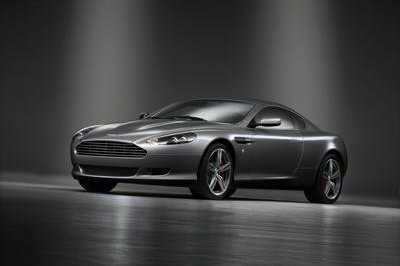 All three stages also come with reprogrammed software for the seven-speed, dual-clutch transmission, and the removal of the Vmax limiter to enhance the car’s top speed past the 155-mph limit. With these upgrades in tow, the tuner’s Stage 1 and 2 kits give the M4 an output of 490 horsepower and 540 horsepower, respectively. Likewise, B&B is also offering a thermostatically-controlled supplementary oil cooler system that comes with a higher flow rate and larger surface area to improve the distribution of heat while also reducing oil temperatures by as much as 25 degrees. With these upgrades in tow, the tuner’s Stage 1 and 2 kits give the M4 an output of 490 horsepower and 540 horsepower, respectively. Those are impressive numbers, but not as impressive as the Stage 3 kit, which pumps out as much as 580 horsepower 553 pound-feet of torque. The Stage 3 kit helps the M4 sprint from 0 to 62 mph in just 3.5 seconds, 1.1 seconds quicker than the standard model. 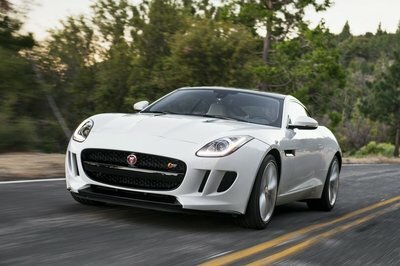 Its 0-to-124 mph time also drops an incredible 2.2 seconds from 13.4 seconds to just 11.2 seconds. 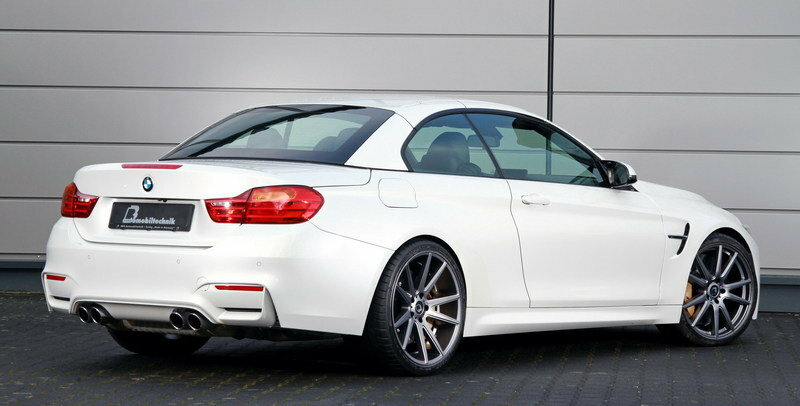 If those numbers aren’t enough to wow a discerning M4 owner, the car’s new top speed of 205 mph definitely should. That last number is enough to give the M4 the kind of supercar numbers that’ll make cars of its ilk tremble in fear. 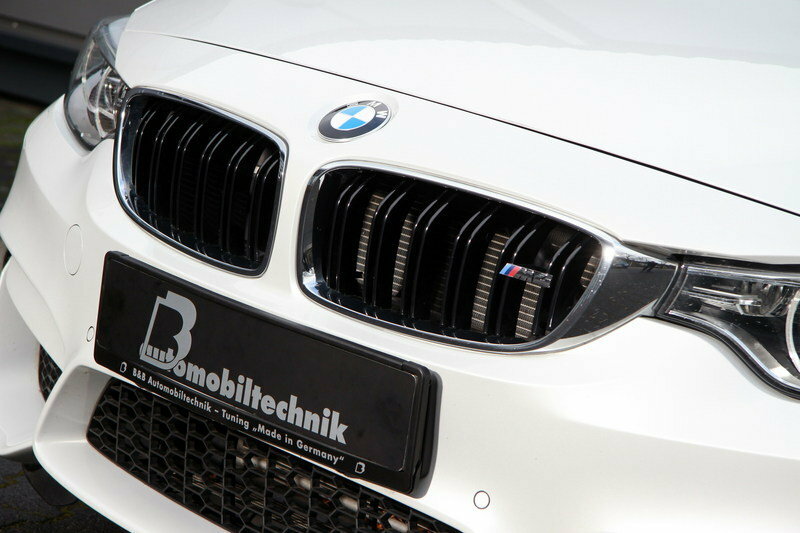 With the incredible jump in power giving the M4 supercar-like performance numbers, B&B is also offering a threaded height adjustable sport suspension kit that lowers the ride height anywhere from 0.19 to 0.98 inches. If the kit doesn’t do the trick, there’s also a set of sport springs that drops the ride height by 1.18 inches at the front and 0.78 inches at the back. And, in case a customer really wants the complete package, B&B is offering its very own coil-over suspension kit it developed with KW. These kit is fully adjustable and comes with damper bounce and rebound adjustment. Pricing details are a little tricky because each kit comes with its own price tag. For instance, the Stage 1 engine kit retails for €1,798 ($1,959) while the Stage 2 kit sells for €2,950 ($3,214). Oddly enough, B&B doesn’t have a price for the Stage 3 kit but with the prices of the two lower stage kits, expect that number to come in at around €4,000 ($4,360). From there, the prices continue with the oil cooler system costing €1,495 ($1,630). Prices for the suspension mods also differ, beginning with the set of sports springs that cost €398 ($433). Meanwhile, the height adjustable sport suspension kit sells for €698 ($750) and the B&B/KW coil-over suspension costs €2,069 ($2,254). The last pricing detail is for the set of 20-inch tires that B&B is offering as an alternative to the stock wheels. The entire wheel and tire set costs €3,950 ($4,303.). There is no shortage of aftermarket programs for the BMW M4, but for this one, I’m going all the way back to the 2014 SEMA Auto Show when German tuner Vorsteiner presented the GTRS4 kit for the M4. 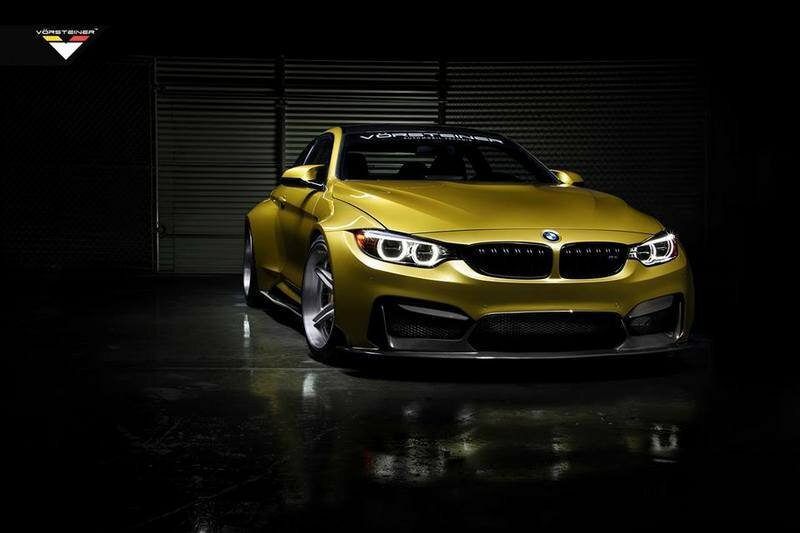 The advantage of this kit is the carbon composite wide-body kit that gave the M4 a racy appearance. Too bad the B&B program doesn’t have that. In fact, the lengths by which Vorsteiner to create the kit - 3D scanning the stock version of the M4 - is pretty impressive in itself. The kit includes fenders that incorporated functional cooling ducts for the brakes, an upgraded front bumper with integrated splitter, aero blade side elements, and a new rear bumper with an integrated rear diffuser. Under the hood, Vorsteiner’s work on the M4’s engine helps increase the output to 550 horsepower and 560 pound-feet of torque, right around the same number as B&B’s kit for the Bimmer sports car. The kit also has KW’s suspension sleeve kit and a larger set of wheels shod in Pirelli P Nero rubber tires. Any conversation of a competitor for the BMW M4 starts and ends with the Mercedes-AMG C 63. 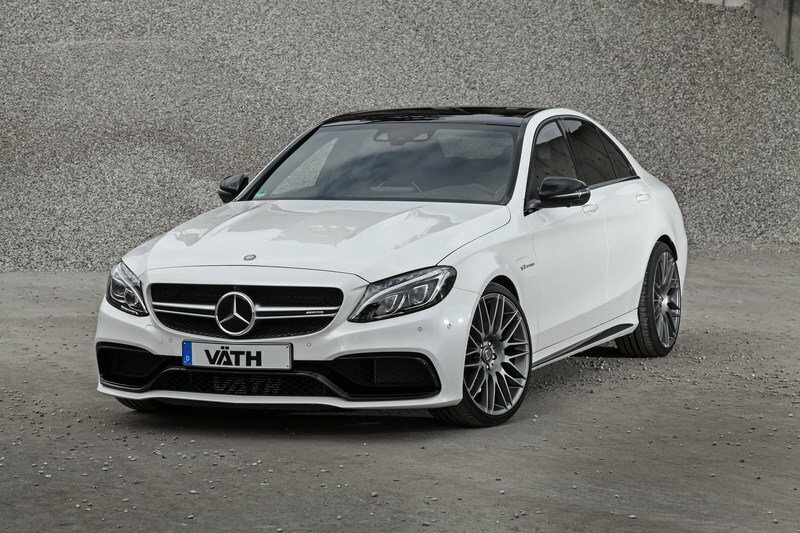 It’s fitting perhaps that in December 2015, German tuner Vath presented its kit for the AMG C 63. That kit didn’t come with any exterior and interior upgrades so the focus was placed entirely on the car’s 4.0-liter, twin-turbo, V-8 engine. Fortunately, Vath knows a thing or two about engine modifications and what it did for the AMG C 63 really proved that. The tuner achieved its desired performance bump, thanks in large part to an engine remap and a new oil cooling system. The result spoke for itself as the AMG C 63 saw its output increase to an incredible 609 horsepower and 598 pound-feet of torque, more than what B&B could get out of the M4. On the flip, Vath said that the AMG C 63 was capable of hitting a top speed of 199 mph, slightly lower than the 205-mph promise of B&B for the M4. I’m a fan of the BMW M4 and I’m an even bigger fan of a tuner that can offer a variety of engine upgrades for the sports coupe. I’m not too excited about the lack of exterior and interior upgrades, but B&B definitely made up for that with all these options. That way, a customer can choose which kit stage he prefers. The fact that all the kits are cheaper than other tuning programs for the M4 is also a big plus for B&B. Good work, guys. Veterans of the aftermarket tuning industry, B&B Automobiltechnik from Siegen have over 30 years of experience upgrading Audi/VW Group cars. With a new remit of broadening their portfolio to encompass other German marques, they are proud to offer a tuning programme for the popular BMW M3 (F80) and M4 (F82) models. A choice of three possible stages of tune takes the power and torque of the BMW TwinPower Turbo straight-six engine from its rated 431 hp and 550 Nm of torque to a high of 580 hp, with 750 Nm. The intermediate Stages 1 and 2 provide 490 hp (1,798 euro) and 540 hp (2,950 euros) respectively, all three stages featuring software adaptation for the seven-speed dual-clutch transmission as well as deletion of the electronic Vmax limiter. The performance boosts are achieved using modified turbochargers, higher-flow intake tract, larger exhaust downpipes, more efficient charge air cooler, and an ECU remap with revised fuel, spark and boost parameters. In Stage 3 form, the M3 and M4 sees the standard 4.6 sec 0-100 km/h sprint tumble to just 3.5 sec, while the 0-200-km/h time is reduced from 13.4 to 11.2 sec. With the 250 km/h electronic limiter removed, the Vmax soars to over 330 km/h, another big number that places the B&B tuned M3 and M4 firmly in the super sports car league. B&B’s thermostatically-controlled supplementary oil cooler system (1,495 euro) is recommended for all three engine upgrade stages. 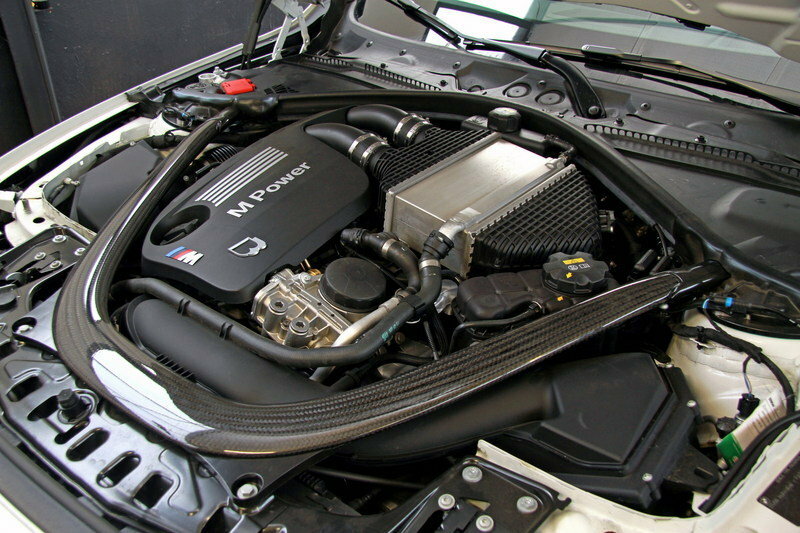 Featuring a higher through flow rate and larger surface area for good heat dissipation, this cooler lowers thermal stress on the motor by reducing oil temperatures by up to 25° C.
To optimise the handling and stance of the BMW M3 / M4, B&B offer a threaded height adjustable sport suspension kit (698 euro) whose lowering range spans five to 25 mm from stock ride height. A simpler alternative is a set of sport springs that lowers the ride height by 30 mm at the front and 20 mm at the rear (398 euro). The ultimate improvement to driving behaviour is achieved with the B&B / KW coil-over suspension. This (2,069 euro) fully adjustable suspension kit offers ride height as well as damper bounce and rebound adjustment, and significantly improves chassis performance. 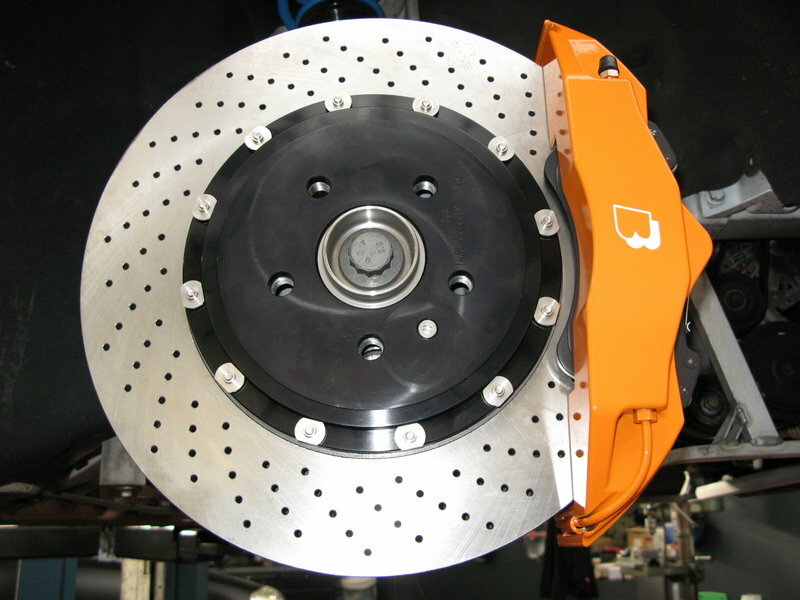 Providing the stopping power to match its uprated straight-line speed, a high performance brake system, which will be available soon, uses 396 mm and 380 mm vented discs front and rear, which can be used with the original 19-inch BMW M-wheels. Moreover B&B offer their own 9.0 and 11.0x20-inch alloy wheels whose staggered offsets deliver the coveted deep-dish look. They are shod with 255/30R20 and 305/25R20 tyres and cost 3,950 euro for the set.